Just over 24 hours since President Donald Trump took the Oath of Office, there has been a dramatic shift in the way Americans will likely find out information about what is going on with the President. If all signals are correct, it will be via one of two methods. The primary way, will likely be through the mainstream news outlets that most are very familiar with, such as CNN, ABC, CBS, Time/Warner, Reuters, Associated Press, Fox News Channel, etc. There exists however the very real possibility that the White House and President Trump may take on a new way of delivering important information to the Citizenry; directly, via the White House website, as well as social media (notably, the Twitter handle @POTUS). During an unannounced press briefing today, newly appointed White House Press Secretary, Sean Spicer, didn't mince his words when he reviewed the events of the past 24 hours since the Inauguration. In what Spicer described as "highly irresponsible and dangerous reporting" by TIME reporter Zeke Miller, this appeared to be a case of "Tweet First, Verify Later." This has been proven to be somewhat of a catch-22 for many media outlets as the competition to collect and broadcast information first on hot-scoops is somewhat of a bloodsport. Get the information correctly, and the news outlet gets rewarded as capturing a "breaking story" before anyone else. Get the information wrong, and until now, not much really happened. That may change shortly. In any event, errors do occur. One would think however, in the midst of reporting of what some could argue is either a highly significant fact, or highly insignificant fact, of whether a figurine / statue of any historically significant person in American culture either currently exists or no longer exists within the Oval Office, should be amazingly easy to confirm or deny. And it is in that aspect that it appears the White House is raising the bar a bit with what has been a historically rocky road when it comes to now-President Donald J. Trump and the Press. A press that President Trump has effectively coined the "dishonest media." In many aspects, the President has a rightful reason to state this claim. On more than several occasions, the press has significantly distorted the truth during Mr. Trump's campaign, generally painting him, as well as his supporters, as racists, bigots, sexists, and an entire list of "-ism's" and "-ists" with a fairly broad and inaccurate brush. 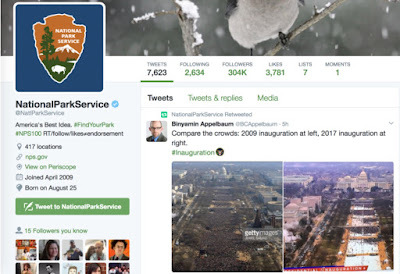 This can still be seen as of yesterday, the day of his Inauguration, as one member of the New York Times tweeted out an image of the National Mall showing what appeared to be significantly smaller numbers of attendees to witness Mr. Trump taking his oath of office, which quickly made it's rounds on social media. The problem? 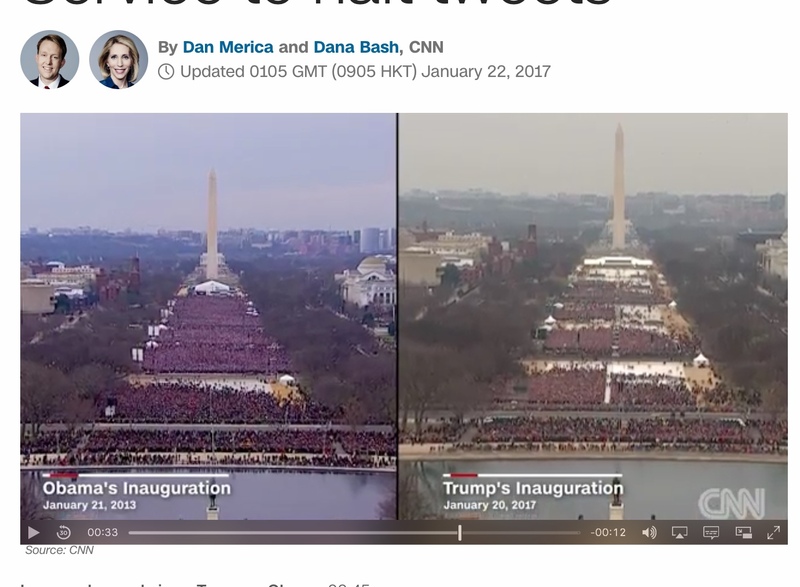 There is little way to verify the time the image was taken, not to mention the fact that security for this Inauguration was easily the tightest it's ever been given the known published threats to "shut down" the event by Anarchists and other less-than-peaceful protestors, not the least of which known as #DisruptJ20. We tracked down the source of the initial tweet that sparked off an online debate as to who had the biggest crowd. Why this was even brought up as an issue is still a bit confusing, but liberal media I suppose is hard-pressed to find stories to print about the 45th President these days, so crowd size now matters it would seem). The comparison was being made between the reported 1.8 million that attended 44th President Obama's ceremony in 2009 and the 45th Inauguration of Mr. Trump. Caught in the crosshairs of this controversy before POTUS 45 was even sworn in, was the National Park Service, who made the mistake of retweeting the image broadcast by NY Times Graphics and later from NY Times journalist Binyamin Applebaum. From our research here, there has been no love lost between the Trump family and the NY Times, easily going back to the 1970's. actual time of swearing in. Times are certainly different in 2017 however; the need for print media has nearly vanished, and major media conglomerates in general have seen the lowest approval ratings since, well, pretty much ever. Depending on the poll used, it can be a toss up between Congress or the Press on which one holds the record for lowest approval rating / trust rating. We went with a trusted poll, Gallup, which clearly shows the steady decrease of trust in the media with only about 32% (and that is being generous; it's likely lower than that). 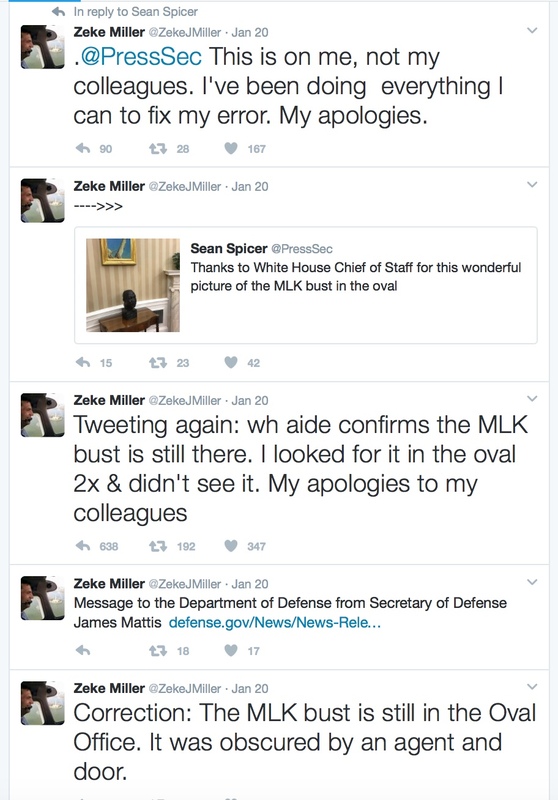 It appears that the White House, and in particular Sean Spicer (Press Secretary) are throwing down a marker of sorts; get the facts right when reporting official business of the President, or don't bother. This is a different type of President. He isn't polished. He isn't bashful. He certainly has no issue pointing out where discrepancies are printed. So my advice to the White House Press Corp would be very simple. Get it right, the first time. There won't be any banning of the Free Press, and there isn't going to be a Fascism takeover of America. But there will be change. And it's actually refreshing. For too long the mainstream press has been able to act as either a propaganda arm of the Executive Branch or as an echo-chamber for various groups, hiding under the guise of "Free Press" to say whatever they like (so long as they correct the record at some point and manner at a later date when they ultimately get it wrong). It is my opinion, that those days are over. Feel free to print or broadcast all of the incorrect information you like, that is your choice as a news medium editor or journalist. Just don't be too shocked if you purposefully get it wrong, to get called out on the repeated errors. President Trump already knows he will be getting judged on his performance as he signed up for that type of scrutiny. These next four years will add a reality check however for the news media, as they too, will be judged for how well they perform. Facts matter, and judging from how poorly the public views the media, they might as well just get the facts right from the President himself. If we are simply going to listen to opinion vs. fact anyway, it might as well simply be his.